An e-cigarette PCC or portable charging case is one of the most common accessories you’ll find with a small electronic cigarette. This is partly a matter of convenience, as the smallest e-cigarette batteries won’t deliver more than 50 or so puffs between charges. 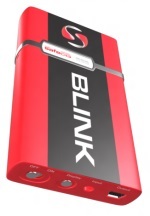 I think that portable charging cases are also popular because they help with product differentiation, though; because the differences between e-cigarette kits are often minute, an e-cigarette PCC goes a long way toward branding a product and helping you remember it rather than someone else’s e-cigarette. Should you look for an e-cigarette kit with a portable charging case? The first thing you should know is that if you plan to buy anything significantly larger than a real cigarette such as an eGo e-cigarette or an e-cigarette mod, a portable charging case won’t be available for your device. This is partly because these e-cigarettes tend to have exceptional battery life. It’s also partly because an e-cigarette PCC for such a large battery would be far too bulky to carry. If you think you’re going to stick closer to the mainstream and buy an e-cigarette shaped like a real cigarette, a PCC is something that you might want to think about. Although two of the reasons might be a little obvious, the third reason is one that you might not have considered if you don’t own an e-cigarette yet. E-Cigarette PCC: Should I buy one? 1. An e-cigarette PCC charges dead batteries. As I mentioned above, the smallest e-cigarettes give you the equivalent of only around 4-5 real cigarettes before you need to recharge them. If you typically spend a good part of the day out of the house and don’t have access to a USB port or wall outlet, an e-cigarette PCC bridges the gap until you’re able to get home. 2. An e-cigarette PCC protects your investment. E-cigarettes are tiny and don’t burn. If you’re anything like many e-smokers, your natural tendency will be to carry your e-cigarette in your pocket when you’re outside the house. Unfortunately, the cartomizer threading can be a weak point in an e-cigarette. If you sit down the wrong way while carrying an e-cigarette in your pocket, you could bend it at the threading and ruin both components. A PCC prevents this from happening. 3. An e-cigarette PCC eliminates a point of failure. The USB charger might just be the most crucial part of an e-cigarette kit because you’ll need it no matter how you decide to charge your battery. Even if you prefer to use a wall charger or car charger, you’ll need to connect the USB charger to use it. What would you do if the USB charger stopped working? Are you trying to stop smoking and switch to e-smoking? Would you have to buy a pack of cigarettes to tide yourself over while you waited for a new USB charger to arrive in the mail? If you’re determined that you want your first puff on an e-cigarette to be your last puff on a real cigarette, making sure that the USB charger won’t be a point of failure is crucial. An e-cigarette PCC charges through a direct connection to a wall outlet or USB port. If your USB charger stops working, your PCC can charge your batteries while you wait for the new USB charger to arrive. Some of the coolest e-cigarette charging cases are the ones that don’t attempt to look like real cigarette packs or cases. Free of this constraint, companies can design their charging cases in ways that make sense. Why should an e-cigarette PCC be as large as a cigarette pack when it only has to hold a battery, an e-cigarette and some cartridges? 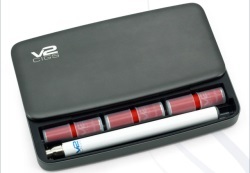 The V2 Cigs PCC is a great example; it’s a really sleek design — and very purse-compatible! 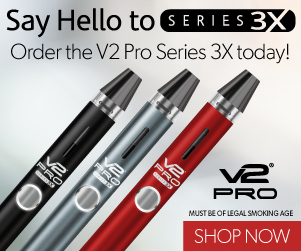 Shameless plug alert: Use the coupon code vapegrl for ten percent off any order from V2 Cigs. A lot of mobile devices such as your phone and iPod run on the same 3.7-volt power as your e-cigarette. It might seem like an obvious idea to build an e-cigarette PCC that can recharge external devices through a USB port, but the Safe Cig Blink PCC is the only case with this feature. This is a great idea because it turns a standard portable charging case into an emergency power solution for any type of device that accepts USB power. When the external power port isn’t in use, you can easily switch the case off to be certain that you’ll never be without power when your e-cigarette battery dies. Sadly, Safe Cig shuttered its doors in 2013. 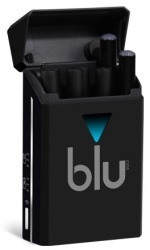 You’ve got to hand it to the folks at Blu; their innovative charging case has propelled a relatively ordinary e-cigarette to the stratosphere by offering something no other e-cigarette PCC has: the ability to help you find other e-smokers, or at least Blu e-smokers. When you enable the Social Features on a Blu charging case, the case actually vibrates when you stand near another Blu user. With millions of people already using e-cigarettes throughout the world, there’s a pretty good chance that you’ll make a new friend before long.